Come and experience the land of the midnight sun! Dawson City is a small lively town bursting with history dating back over 100 years. Our operation is nestled between wooden boardwalks and historic Gold Rush buildings. This colorful community provides a unique experience for not only our guests but our team as well. http://www.dawsoncity.ca , www.yukoninfo.com and www.travelyukon.com. Join our Dawson City team and create memories that you will be sharing for years to come. Come experience living in the land of the midnight sun and have the opportunity to meet new friends from all over Canada and the United States. We always encourage our staff to explore their new home on their days off. Go river rafting, camping, hiking or even canoe down the famous Yukon River. We also have monthly staff events and encourage our staff to join in all of the activities that happen in the Dawson community, such as our world famous Music Fest weekend. Our training will begin in mid-May and the season will typically end around September. We look for candidates that are available until the end of the season. All of our full-time jobs are 5 days a week – 8 hours a day – we also try to give you 2 days off in a row so that you can enjoy your time in Dawson – although due to unforeseen circumstances this isn’t a guarantee (but we do try real, real hard to do this for you). We offer discounted/rebated employee housing in the community where housing options are limited. Housing Type: Employee housing available; 56 beds total. Shared accommodation in fully furnished and stocked houses. Wi-Fi, laundry, linens, TV and local landlines included. 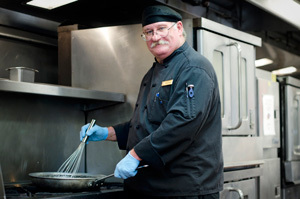 Why Work at the Westmark Inn Dawson? Upon your arrival in Whitehorse, you will be picked up by a shuttle. Speak with your hiring manager for more information.